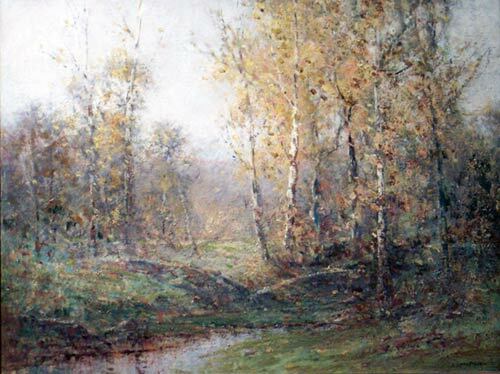 Woodland Scene, oil on canvas, 18.5" x 24.5, 27" x 33' ( framed), s.l.r. Etcher, watercolorist, and painter in oils, Edward Loyal Field was an artist of considerable versatility. He was born in Galesburg, Illinois in 1856 and, as a young man, went to Paris, where he studied in the popular atelier of Carolus-Duran. He returned to the U.S. in 1882, taking up residence in Manhatten, where he remained throughout his life. Field exhibited extensively in cities throughout America and was a member of both the Salmagundi Club and the Boston Art Club. Though apparently successful in his lifetime, little is known about the artist today. Of particular interest is his association in the ’90’s with the Pakatakan art colony near Arkville, New York, in the heart of the Catskills. 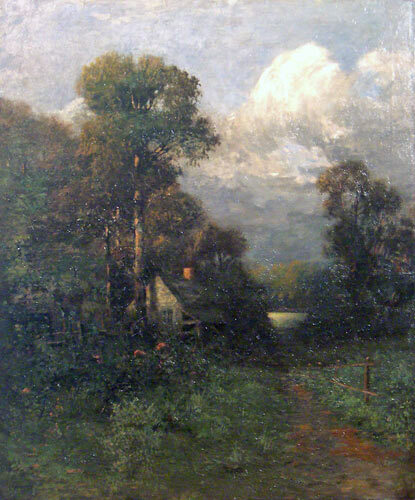 The presence of Field, John Francis Murphy, Ada Clifford Murphy, and Alexander Wyant make the Pakatakan colony significant in the history of American Tonalism. Field died in New York City only months before the outbreak of World War I. The modern neglect of Field and his work is unfortunate in that he was, in the opinion of this writer, one of the more accomplished practitioners of the Tonalist aesthetic. Like his well known colleague at Arkville, John Francis Murphy, Field focused on landscapes notable primarily for their commonplace features, often adding a figure or a cottage for bucolic effect. Rarely, though, does Field’s work evolve into Wyant’s sometime murkiness or Murphy’s minimalism. One of the most prominent traits of Field’s work is a strongly focused light on a clump of trees or a small section of the landscape, giving an otherwise undramatic scene an element of drama and a distinct sense of temporality. Field’s paintings are also characterized by a decided impasto which gives the work almost three dimensional definition and a tactile surface. Field’s work can be found in the Columbus (Ohio) Museum of Art, The Butler Museum of American Art, the Nelson-Atkins Museum ofArt, the Holyoke Museum, the Jersey City Museum, and the Nutley (N.J.) Museum.